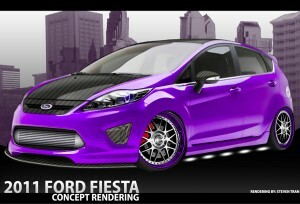 The little Ford Fiesta too will be playng a big role at 2011 SEMA show. Well, not as big as the Focus, but still, the car has a huge customer base and they would like to customize and tune it at some point. Ford will be presenting three Fiesta models at this year’s show, all of which designed not for the best practicality and sportiness, but to emphasize on the Fiesta’s potential for custom jobs. The M2-Motoring Fiesta combines form and function by adding an Injen Technologies cold-air intake system and DC Sports cat-back exhaust. The chassis is upgraded with a Wilwood big brake kit and Megan Racing coilovers. Exterior enhancements include a candy purple finish by Status Motorsports, 3dCarbon body kit and upper roof spoiler. Interior treatments offer an upgraded Jensen Mobile Audio Power sound system and Audiovox flip-down touch-screen monitors. This Fiesta SE hatch is built for performance with a Jackson Racing Rotrex intercooled supercharger, Wilwood four-piston front, two-piston rear brake system and Hankook Ventus racing tires. Appearance offerings include APR Performance rear wing and custom front splitter, 3dCarbon body kit, Socal SignWorx graphic wrap and Gold Coast Automotive fender flare kit. With plenty of personalized details, this Fiesta offers a Weapon-R Secret Weapon air intake, Wilwood Dynapro six-piston big brake kit and Advanti Racing V3 Vago 17-inch wheels. The exterior features BASF custom bright silver matte metallic paint, while the interior delivers plenty of upgrades including Portage Trim red leather upholstery, Bride Vios III racing bucket seats and MB Quart Onyx Series speaker and amplifiers. More details after the SEMA show.